Hello. Today I’d like to share with you what Satisfactory Academic Progress is, how it affects your financial aid status and what it means to your success as a Walden student. Satisfactory Academic Progress is a set of federal requirements separate from Walden University's academic continuance guidelines. Did you know that in order to continue receiving financial aid, you need to meet the minimum cumulative GPA and completion rate as well as maximum time frame requirements for your program? By understanding these three financial aid progress requirements for your program and consistently tracking your academic progress through your myWalden portal, you can remain in good standing and focused on your education. In the case of your GPA requirement, if you get a D grade in a course, you would have completed the course but you would negatively impact your cumulative GPA. While it is true that your completion rate is 100%, the Satisfactory Academic Progress requirement states that undergraduate students must maintain at least a 2.0 cumulative program GPA, while graduate students must maintain at least a 3.0 cumulative program GPA. As far as course completion, if you have attempted 10 credits but withdraw from 5 credits, your cumulative course completion rate would be 50 percent even if your cumulative GPA is above the minimum requirement. 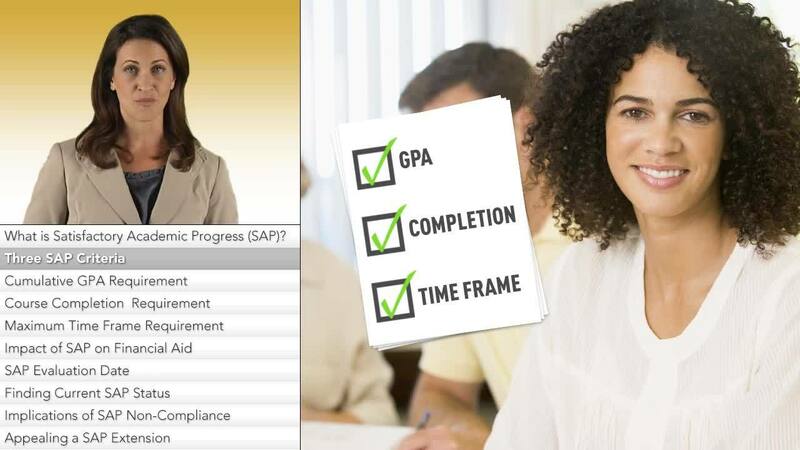 The Satisfactory Academic Progress requirement states that all students, both undergraduate and graduate, must complete at least 67 percent of their attempted courses at Walden University. The maximum time frame requirement is when your financial aid eligibility expires once you reach the maximum timeframe for completing your program. For example, for bachelor’s students, the Satisfactory Academic Progress requirement states that you are eligible for financial aid up to 272 attempted credits. For maximum time frame requirements for all other programs, please review the Financial Aid Terms & Conditions document found on the Walden website in the Financial Aid section. This is why it is important that you remain aware of the impact common decisions such as withdrawing from a class or not passing a course could have on your financial aid eligibility and academic standing. It is important to note that your Satisfactory Academic Progress status is evaluated at the beginning of each term after your grades have posted from the previous term. A term is defined as a 12 week quarter or a 16 week semester. If you do happen to fall below the cumulative GPA or cumulative course completion requirement within a term, your financial aid eligibility could be impacted for the next term. You must maintain Satisfactory Academic Progress in every term to remain eligible for financial aid. You can view your most up to date Satisfactory Academic Progress by clicking on the 'Messages' tab. Be sure to visit your myFinAid portal every term to track your GPA and course completion rate. Now, let’s discuss what happens when you’re not in compliance with Satisfactory Academic Progress requirements after a term. Well, your next term enrollment will be considered your only Warning Term, which will provide you with an opportunity to return to Satisfactory Academic Progress compliance and restore financial aid eligibility. You will receive an official email that notifies you that you are not meeting Satisfactory Academic Progress and will include all the requirements you need to fulfill in order to return to good standing. Due to our processes here at Walden, please keep in mind that this e-mail will arrive after your Warning term has begun, since if you recall, Satisfactory Academic Progress requirements are reviewed at the beginning of each term. For this reason, it is important to view your financial aid portal regularly in order to have the most up-to-date information. If you have reached Satisfactory Academic Progress requirements once your Warning Term has come to an end, your financial aid eligibility will be restored. If you have not met the Satisfactory Academic Progress requirements, then you will lose your financial aid eligibility entirely. However, if you can document a temporary, unusual and unexpected circumstance that lead to your lack of progress and how you have improved over the warning term, then you may file an appeal with the Office of Financial Aid within 15 days after your Warning Term ends. You can find the appropriate forms under the ‘Forms’ tab of your myFinAid portal. Discover the performance requirements needed to maintain your financial aid.